My father was, above all, a person who made things. He was a full-time creator with a capital AC. @ Most people are familiar with the public face of his creativity, the books that he and my mother made over their sixty year collaboration. But there was another side to Stan=s creative impulse, a private side directed toward his children B toward me and my older brother, Leo. It was one which had a great effect on us. A good example was the time when, at about age six, I became interested in knights in armor. I had a book with illustrations of medieval weapons and equipment, including catapults. I fell in love with those catapults. I showed them to my Dad. He, I think sensibly, refrained from building me a real working catapult. But he did offer to make scale models of the ones that were in my book. He took me to the local hobby shop where we bought a supply of balsa wood, the kind you use for making model airplanes. Back home, Dad drew up some plans, got out his x-acto knife and Duco cement and set to work. As I watched, he created perfectly scaled models of the warlike creations of a thousand years ago. Not only did they look perfect, but they worked, too. The wheels on the siege tower turned. The arms of the catapults pivoted. He created illusory details out of simple materials. He made ropes out of twisted thread. He made leather thongs out of sliced masking tape. But what I remember most vividly was when he took a sharpened lead pencil and used it to make lines in sheets of balsa wood so that it looked like they were put together out of tiny planks. Then, he took the point of the pencil and poked little holes at the end of each plank so that they looked just like the heads of nails holding the planks in place. For me, it was magic. Unfortunately, I then took the models and played war games with them, and they did not fare well. But my father didn’t mind. By then, he had gone on to other acts of creation. He was drawing cartoons for magazines, or painting a picture, or writing a book or inventing a new TV show, or a hundred other things. Of course, my father had a partner in all this creativity, my mother, Jan. During their long career together, they were sometimes asked whether they ever disagreed about their work. They always replied that, no, they didn’t disagree, but that they sometimes Aagreed, vigorously. @ Their marriage had to be unusually strong and close to survive the stresses of both a professional and personal relationship, especially when you consider that they spent about 99.9% of their married life literally in the same room together. I don=t think it was any accident that my father was able to communicate the wonder and enthusiasm of his creativity so directly to me and to my brother when we were children. I think that the impulse of his creativity was, at heart, child-like B the same impulse that compels a child to make mud pies, or dress up in a costume, or invent an imaginary companion to play with. 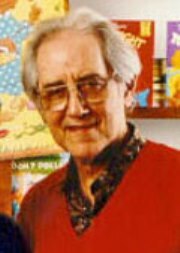 And I think it was no accident that he communicated so effectively and powerfully with children through his books. He retained his own child-like delight in creation throughout his long life and I think the world is a better place for it. What wonderful people. Finding all of my bear books to read to my new grandchild(first time grandmother)due in January. Thank you, Bonnie! Congratulations on being a first-time grandmother! My family and I love the stories your family have created. They have become a staple of our bedtime routines. Thanks for your work. I loved reading this. My kids are huge fans…At least once a day we read a Berenstien Bear book, watch the TV show often, visit the exhibit at our children’s museum regularly….we are even modeling my daughter’s birthday party in a couple of weeks after Sister’s in Too Much Birthday (minus the ponies and merry-go-round!). It’s lovely to learn more about the creator of the kind creative bears that have had a such a positive influence on my kids …. and our whole family. Thank you for posting this tribute. It helped bring back the few memories I do have of my childhood. When I was little, my mom used to read their books to me before bed. And I love my mom so much that those memories bring a slight tear to my eye. Awww … what a sweet comment – thank you so much! Mom’s are very special, indeed! 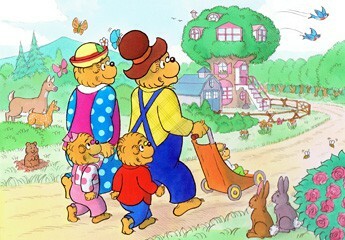 I loved The Berenstain Bears as a child, and now my 2 year old adores the books and shows as well. I love how “safe” the stories and shows are for any age, always cute and entertaining while always demonstrating a lesson on how to be a good person ( or bear haha!) I always get a good and cozy feeling when we read the books or watch the shows..still now in my thirties..thank you! Thank you for your very kind comments! Please give your little cub a great big *bear hug* from Mama, Papa, Brother, Sister, and Honey. I’ve grown up (and still am growing up) with the Berenstain Bears. I remember laughing about Papa Bear’s foolish antics. How could I not love these little books? My six year old brother loves them too. At our grandparents’, we watch the show all the time. He laughs very much. It is great to see your tribute to your parents. It is very special (not to mention sweet) when someone remembers and honors your parents. Your parents have meant so much to me and to my family over the years. Through their books we all felt that they were good friends of ours. I shared the books with my son and hope to share them with his daughter soon. I also use them in my teaching (first grade and now kindergarten). I especially like the way “Strangers” talked about not talking to people (bears) you don’t know. This was handled in a way that children would learn to be careful but not terrified. Thank you for sharing your memories!! Thank you so much, Betty, for your very kind comments. What a great tribute to him like everyone else I also grew up on the Berenstain Bears books and to this vere day I still enjoy reading them specialty the Holiday ones. Your parents truly lived the life they were meant to live together and it is reflected in their love for each other, their love for their children, and the creativity in their work. Because of their ability to tap into their God-given talents and purpose, we all benefit. My children and I will always cherish their stories and art. Thank you. Thank you so much for such lovely comments. We are very grateful! My six year old daughter could read a Berenstain Bear book every night and, honestly, I could read her one every night. Thank you so much for your wonderful books. Thank you for your very kind comments, Bethany! My daughter (now 35 years old and a teacher) fell in love with your books when she was young and everytime a new one came out we made a big production of purchasing it (no matter how tight money was!). We would go home a read it immediately. Now my grandaughter (my daughter’s daughter) is just as hooked on them as her mother was. They have all of my daughter’s original books as I saved them over the years. Now I take my grandaughter out to buy the new books. She also has to watch the TV show when she is with me. Thank you for making wonderful memories and for keeping the family tradition alive!! Susan, Thank you for such very nice comments! You have made our day in the tree house! Please give your granddaughter a great big *bear hug* from Mama, Papa, Brother, Sister, and Honey.